In the morning of November 15th, at the headquarters of the Committee for Ethnic Minority Affairs, Deputy Minister, Vice Chairman Dinh Que Hai met and worked with the delegation of special speakers about the right of food of United Nations Human Rights Council leading by Hilal Elever – the special Speaker. Attending to the meeting, there are representative of leader and expert of the International Cooperation Department. At the working session, the delegation of special speakers about the right of food of United Nations Human Rights Council had exchanged, learned about the situation of Vietnamese ethnic minority area as well as policies on food production to ethnic minority people and saw contents involved in the right of food. The delegation also hoped to be shared the food’s difficulties which ethnic minority people have to face like: what support do people need from the Government and their wishes, etc. 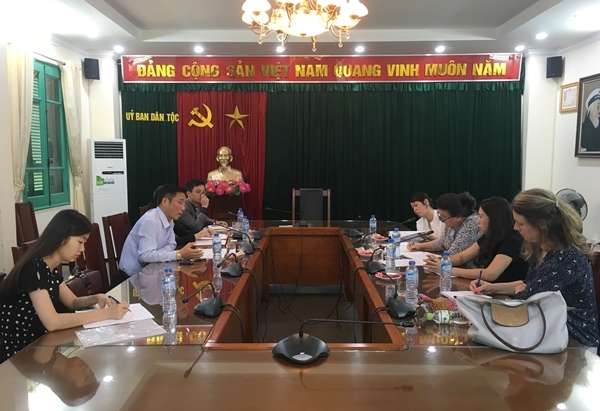 The Deputy Minister, Vice Chairman Dinh Que Hai specifically informed to the delegation about the food production in ethnic minority area in Vietnam, policies involved in supporting land for production and production; policies and results supporting people in poverty reduction. On behalf of the delegation, Mrs. Elever thanked the Deputy Minister, Vice Chairman Dinh Que Hai for spending time to meet the group and providing full, particular information about the situation of ethnic minority area and issues involved the right of food. Hilal Elever said, in the future, the delegation will have observations in some local areas, Cao Bang will be the first one to study about execution of the right of food in Vietnamese ethnic minority area.